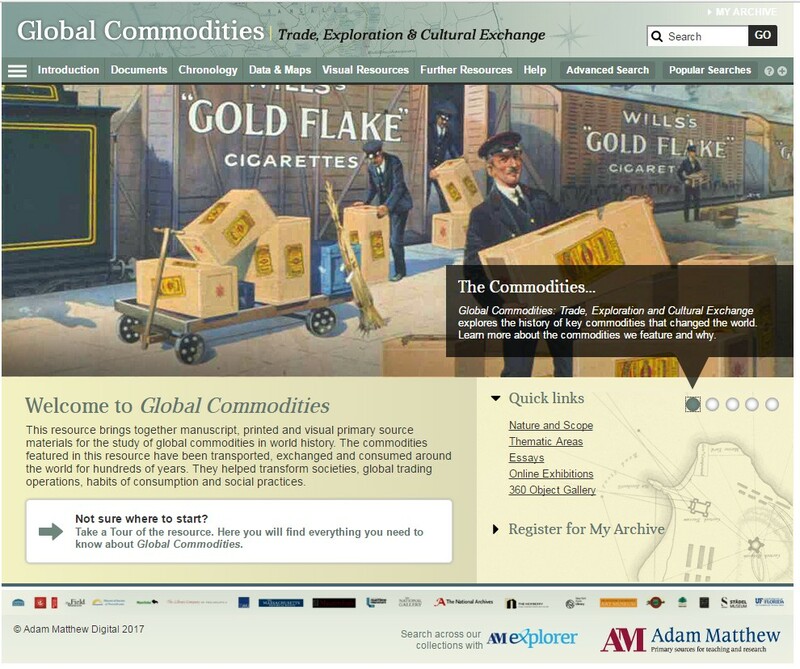 The Library has a number of e-resources trials running at the moment and this includes trial access to the fascinating primary source database Global Commodities: Trade Exploration & Cultural Exchange from Adam Matthew Digital. Using a range of visual, manuscript and printed materials sourced from libraries, companies and trade organisations worldwide this database allows you to explore the history of fifteen major commodities and to examine the ways that these have changed the world. Digitised material in the database include historical maps, business accounts, statistical records associated with global trade and commerce, including prices current, bills and entry and trade returns, mercantile papers and correspondence, dock records, advertising memorabilia and ephemera and much more. This entry was posted in Library, Online resource, Trial and tagged Databases, History, International Relations, primary source by cstirling. Bookmark the permalink.